Krishna Reddy: FireTorrent: A built-in bittorent client for Firefox. FireTorrent: A built-in bittorent client for Firefox. 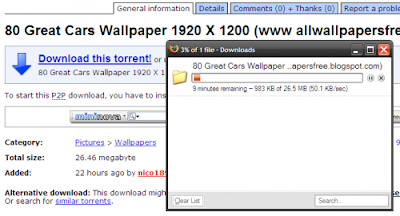 This addon lets you download BitTorrent files directly from Firefox with just a single-click. That means you are no longer restricted to have a BitTorrent client first before you can download a torrent. To start downloading a torrent, all you have to do is click a torrent link, and it will automatically start downloading in Firefox’s Download Manager just like normal files. Currently, this addon is in its early stages and have capped uploading at 15kb/s. Even the preferences panel has been disabled, but will be enabled in the next version. This addon works with Firefox 3.0 or higher, running on Windows, Mac and Linux. So far this addon is invite-only, and you can signup for an invitation at its official site. But if you would like to try it earlier, download it from the link below.